Today, there are several effective options out there for patients who are struggling with the loss of one or more natural teeth. 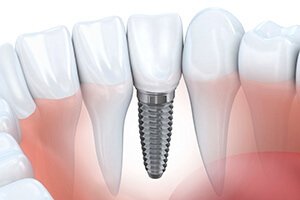 Here at Pasadena Family Dentistry, though, we believe there’s one that stands out above the rest – dental implants. 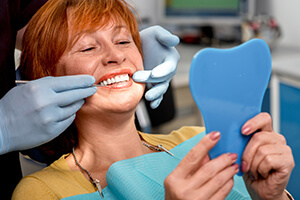 Implants are virtually seamless in feel, function, and appearance when compared to your natural teeth, and they can also be used to anchor dentures and bridges in place for a healthier and more confident fit. If you’d like to learn more about this transformative procedure or schedule your first appointment, please don’t hesitate to give our Pasadena, TX office a call! The secret behind the success of dental implants is simple – unlike other services, implants recreate both the root and the crown of your natural tooth instead of only the latter. With a new tooth root in place, your jawbone is stabilized and preserved, and patients are much less likely to experience deterioration over time. After our team has determined that you’re a good candidate for dental implants, the first step of the procedure involves their surgical placement within the jaw. Dr. Holmes, Dr. Revel, and Dr. Lowry will partner with a trusted specialist in the area to ensure that this portion of your care is as comfortable and successful as possible. Once the implant is in place, a process known as osseointegration begins. This means that your natural tissue will gradually start to grow around the implant and create a strong bond with it. This sets the stage for the placement of a new, custom-made restoration once you’ve healed enough to return to our Pasadena, TX location. Our doctors offer multiple implant restorations, and our recommendation will depend on the number of teeth/implants that require coverage, as well as the patient’s personal needs and preferences. For instance, all-ceramic dental crowns are designed to cover individual implants so that surrounding natural teeth can remain healthy and unaltered. For multiple implants, an implant-retained denture/bridge may be ideal, which can replicate several teeth at once for a more cost-effective solution. No matter what the patient’s final choice is, their new restoration will be an excellent match for the tooth/teeth they lost. With your new dental implant(s) in place, it’s likely that your diet, your speech, and even your self-confidence will improve as a result. We look forward to helping you regain the complete and beautiful smile you deserve!